There is no age limit for learning how to swim. Blue Buoy offers adult swimming classes that make you feel comfortable in the pool. Our teaching methods are different from other Orange County swim schools, allowing you to learn how to swim, and have fun in the process. You will open up a wonderful world you may have spent your entire life avoiding, and all the activities it offers! We take away the stress of learning how to swim, taking each step slow while we build up your confidence — one stroke at a time. Every adult in your class is in the same boat, making learning how to swim an encouraging and positive experience because every swim student wants to see each other succeed. If you’re an athlete who is training to compete in a triathlon, Blue Buoy Swim School offers advanced training to take your swimming to the next level. We can help turn your choppy strokes into long gliding strokes and help make your labored breathing effortless so that you look forward to the swimming portion of your next triathlon. 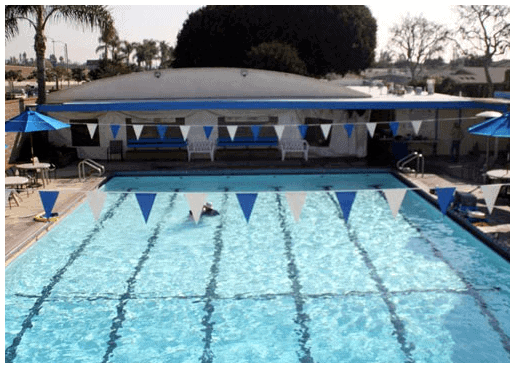 The size of our adult swim classes in Orange County vary from a few people to 8 or so. The instructor will work with you individually to introduce a swimming technique, or perhaps with another student at the same level. We make sure to find the learning style that you are most comfortable with, ensuring you enjoy learning how to swim. You then spend time practicing that technique. The instructor will check on your progress and refine what you are doing or introduce new techniques throughout the 1-hour class, always making sure you get the attention you need to improve your swimming skills in the water. We offer an Adult Swim Class (8:1 ratio) Tuesdays 7:00pm – 8:00pm. For more information on Adult Swim Classes and scheduling feel free to contact us.